JDM programmer: This circuit can be used to program a flash-based microcontroller. It interfaces to a PC through its serial port (COM). This programmer does not require an external adapter to provide power to the circuit as it draws current directly through th PC serial port. 2-wire LCD interface: Interfacing to a popular Hitachi-based LCD requires use of six or ten pins of a microcontroller which limits the number of I/O pins that can be used for other applications. With a flip-flop memory IC, it is possible to reduce the number of pins required to two. angel-eyes splatbot: Armed with a paintball gun, this robot with an attitude fights other splatbots in an enclosed area. 12V battery charger: This charger recharges 12V sealed lead acid battery. This charger provides a high voltage/high current until the battery is recharged, then drops voltage to a safe level. 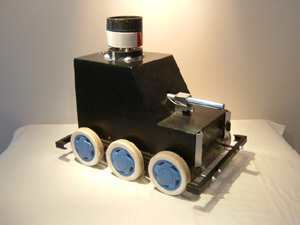 Bobette firebot: This 9 inch diameter robot wanders in a miniature home to detect and put out fires. Digital sound recording/playback circuits: These circuit record sound in non-volatile memory for playback purposes. PIC18F SDCC port: C compiler for PIC18F microcontrollers. Jolt PIC18F bootloader: This program allows downloading of new microcontroller firmware through serial port. Voltage stepper: This circuit steps a voltage of four to six volts up to a voltage of twelve volts. Tone generator: This circuit generates a fixed frequency tone (for instance a 1 kHz tone). This robot fights other robots in a 20 foot by 20 foot arena with obstacles. 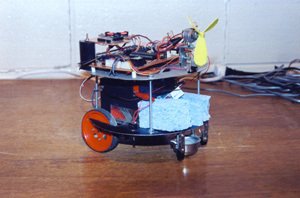 Each robot is equipped with a paintball gun and must hit target as many times as possible in a fixed amount of time. The first "official" competition was held in November 2001. I was responsible to write the software for this robot. This robot must find and extinguish a lit candle in a 8 foot by 8 foot model home. Bobette was able to qualify in the 2002 Trinity College fire-fighting contest but unfortunately was not able to extinguish the candle flame.